When the economy crashed, real estate and stock markets took a massive hit—a hit that they are just now beginning to recover from. This hit started what we now refer to as the “Great Recession.” In this period, many Americans saw their retirement savings—particularly 401ks—routinely post losses or, at best, minimal gains. Now, that the American markets are beginning to dust themselves off and make a comeback, it’s time for people to begin to set right their retirement accounts.Here are a few ideas for boosting your retirement savings and recovering from those wasted years. Generating better than average or good returns with your 401k means you need to work. You cannot sit back and hope for the best. It’s time to get on the phone with your financial advisor and discuss how you can be more involved and aggressive when it comes to your retirement account. In the early days of the crash, financial planners were astounded that there was no panic, no rush to sell, or any sign that it was anything other than business as usual. In fact 80-percent of 401k holders did absolutely nothing to reallocate the assets in their retirement accounts. As a result, they lost even more. You need to actively ensure that your 401k assets are properly weighted and generating the returns you need to get back on track. Do not trust that your financial advisor will do this for you—or trust but verify. You need to work together to ensure that your goal of retiring with sufficient savings to last you a lifetime is met. The easiest way to make up the difference between how much should be in your 401k and how much is actually in your 401k is to contribute more. It really is that simple. Unfortunately, many people lower their contributions in tough times rather than increasing their contribution level. This could be a mistake. You should not stop at just the amount your employer is willing to match. You should aim for the maximum contribution allowed by the government. It is the best return on your dollar. Not only does your employer match some of your contribution. Your contributions are not taxed, that means that for every $100 contributed you are only out of pocket $72—if you are in the 28-percent tax bracket. 1.5-percent does not like a significant amount of money, but when that 1.5-percent fee for monitoring your 401k is taken each year for 30 or more years, the amount can be significant. 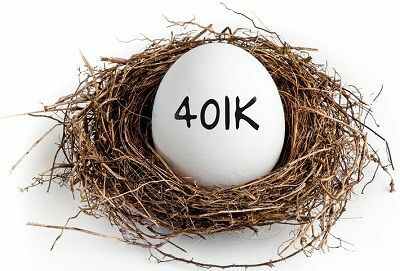 If only it were as simple as switching to a 401k to a lower cost 401k, but it is not always easy to determine how much you are being charged, It may take a bit of digging to find out exactly how and how much you are charged each year. Once you do determine your total costs, you can begin cutting those costs. You can this by switching to low cost funds such as index funds or institutional funds rather than investing your assets in actively managed funds like stocks. If your current plan does not offer any low cost options, you may have to divert some of your retirement savings into an IRA or Roth IRA. As you near your retirement, it is time to protect your 401k. Growth is secondary to asset protection for the final 5 years before retirement. You do not have the time to build your funds back up if the market takes a turn for the worse. At this time, you should move your assets to safer, lower yield, funds. Imagine losing 25-percent of your retirement savings right before your retirement date. Unfortunately, many people who planned to retire in 2010 experienced this tragedy first hand. They invested in risky, emerging markets and lost a significant amount of their retirement savings. One way to avoid risk as you approach retirement age is by using target date funds. These funds naturally move to safer, risk averse investments as the retirement date draws near, but as good as these target date funds are, it is up to you to make sure your 401k manager is doing his job and moving your assets to low risk areas of investments. If your 401k is depleted and you feel the need to take drastic measures, you do have another option. You can roll your 401k into a self-directed IRA. This tax deferred retirement investment tool allows you a wider range of investments than a traditional 401k. You can even use you self directed IRA to invest in real estate or startups, but it is risky. It is self-directed and you need at least a working knowledge of finance and investment strategy to make this risky, but potentially rewarding, retirement savings tool. Many Americans fell behind on their retirement savings during the crash, but that does not mean you cannot recoup your losses and get back on track. It just takes a concerted effort on your part. The first step is to call your 401k manager and begin to hammer out a plan to reach your retirement goals.